Workers put down the padding and new field turf June 7 at Frank Zink Field in Beavercreek. A clump of end zone turf waits to be removed from Beavercreek High School’s Frank Zink Field as part of a turf improvement project funded by Miami Valley Hospital. 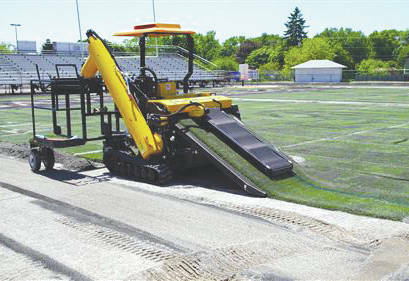 A machine sits idle in mid-strip of a layer of the old football field turf June 6 at Frank Zink Field at Beavercreek High School. As part of the project, the school’s athletic running track was being resurfaced as well. 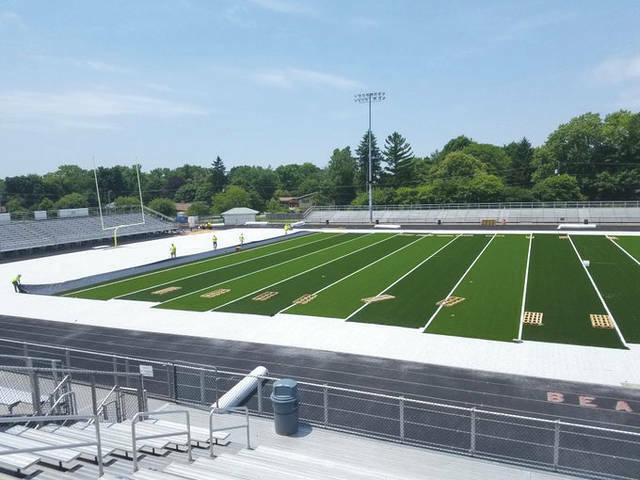 BEAVERCREEK — Replacement of the football field’s artificial turf is nearly complete at Beavercreek High School’s Frank Zink Field, and the running track that surrounds the field is expected to be resurfaced, as part of a tax-free improvement project. According to Athletic Director Brad Pompos, the entire cost of the project is being funded through a renewed partnership deal with Miami Valley Hospital. Pompos said the project will require no expense from area tax payers for the required maintenance of the stadium, adding that the 10-year-old artificial turf would not have passed this summer’s rounds of G-Max testing for concussion management. 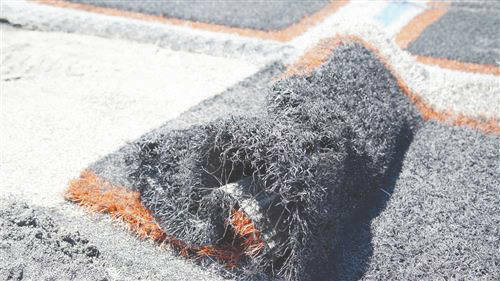 The old turf had been under warranty to last eight years, but Pompos said careful maintenance procedures helped the district squeeze two more years out of the turf’s use. G-max testing measures the amount of shock attenuation that a field absorbs during a typical impact. The standard rate of attenuation for most artificial turf fields is 200 g’s. If the surface no longer meets that requirement, it should be replaced. The project is expected to be finished sometime in early July 2018. According to the miamivalleyhospital.org website, Miami Valley Hospital currently has school partnerships with Beavercreek, Bellbrook, Fairborn and Greeneview High Schools in Greene County, plus Springboro and Centerville Highs in Montgomery County. The Hospital also has college partnerships with the University of Dayton and Wright State University.